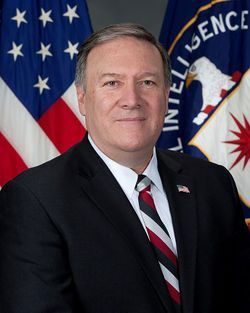 Michael Richard Pompeo (born December 30, 1963) is the United States Secretary of State under U.S. President Donald Trump. Previously, he served in the United States House of Representatives from 2011 to 2017, and as the Director of the Central Intelligence Agency from 2017 to 2018. He is a member of the Republican Party and served as a Republican National Committeeman. On March 13, 2018, President Trump announced he would fire U.S. Secretary of State Rex Tillerson and appoint Pompeo to replace him. The Senate confirmed him on April 26, 2018. Social conservatives supported Pompeo's nomination. He became an influential member of the administration. He visited North Korea two times and helped successfully free the 3 Americans detained by the country. Pompeo criticized the Iran nuclear deal, saying that he looks "forward to rolling back this disastrous deal with the world’s largest state sponsor of terrorism." Israeli Prime Minister Benjamin Netanyahu called Pompeo a "true friend of Israel." The trade war by China against the United States has been going on for years. Pappas, Alex (March 13, 2018). Trump says Rex Tillerson out as Secretary of State, replaced by Mike Pompeo. Fox News. Retrieved March 14, 2018. Spiering, Charlie (March 13, 2018). On Twitter, Donald Trump Announces Mike Pompeo as Secretary of State; Rex Tillerson Out. Breitbart News. Retrieved March 14, 2018. Wong, Kristina (April 26, 2018). Senate Confirms Mike Pompeo as Secretary of State. Breitbart News. Retrieved April 26, 2018. Sands, David R. (April 26, 2018). Trump gets his man as Senate confirms Mike Pompeo for State Department. The Washington Times. Retrieved April 26, 2018. Pappas, Alex (April 26, 2018). Mike Pompeo confirmed as secretary of state; Senate OKs Germany ambassador. Fox News. Retrieved April 26, 2018. Greenwood, Max (May 1, 2018). Pompeo issues first tweets as secretary of State. The Hill. Retrieved May 2, 2018. Spiering, Charlie (May 2, 2018). Donald Trump and Mike Pompeo: State Department Will ‘Get Its Swagger Back’ — Represent America First. Breitbart News. Retrieved May 2, 2018. ↑ Berry, Susan (April 26, 2018). Mike Pompeo Confirmation a ‘Pro-Life’ and ‘Religious Freedom’ Victory. Breitbart News. Retrieved April 26, 2018. ↑ Freiburger, Calvin (April 27, 2018). Pro-life Pompeo confirmed as Secretary of State; abortion advocates pounce. LifeSiteNews. Retrieved April 28, 2018. ↑ Taylor, Guy (March 17, 2019). Mike Pompeo has Trump's ear, but who really wields the influence? The Washington Times. Retrieved March 19, 2019. ↑ Van Buren, Peter (March 15, 2018). Commentary: The pros – and cons – of Pompeo as secretary of state. Reuters. Retrieved November 11, 2018. ↑ Lazaroff, Tovah (April 29, 2018). NETANYAHU: 'I’LL TALK WITH U.S. SEC. OF STATE POMPEO ABOUT IRANIAN AGGRESSION'. Jerusalem Post. Retrieved November 11, 2018. Mike Pompeo is rumored pick for secretary of state: What to know about him, Fox News, by Zoe Szathmary, November 30, 2017. This page was last modified on 9 April 2019, at 12:37.